We had beautiful weather this weekend, so I took advantage of it on Saturday and decided to make it a productive farm day. I let everyone out to free range for a while, then I hit them with the bad news – it was time for their worming and hoof trimming. I don’t worm my goats monthly, but on an as-needed basis. 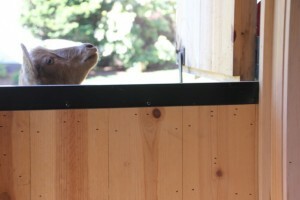 The guys I bought Princess Kate from at Whitmore Farm taught me about the FAMACHA eye color chart as an indicator of worms and was what they used for their large herds of Tennessee Fainting Goats and Katahdin Sheep. Upon researching it I discovered that sheep and goat are suffering resistance to treatment for worms due to the overuse. This FAMACHA chart has been proven to be a good indicator and is how I now treat my goats on an as-needed basis. 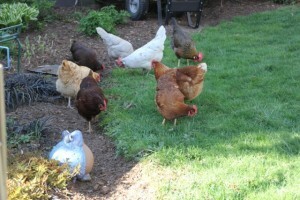 However, the new spring grass growing virtually guarantees the need for a preventative worming. They don’t like the taste of it, but I think they enjoy putting on a show for me more than anything. The hoof trimming, however, is another thing. I’ve never done it without assistance from a vet before, and after a futile first attempt, I decided I could finally put the milking stand to good use for this. Once I got their head’s locked in with plenty of food in the bucket, I didn’t have too much of a problem. 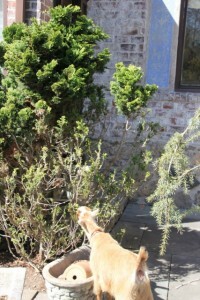 Like trimming a dog’s toenails, you just have to be careful not to cut down too far, so you take off a little at a time. 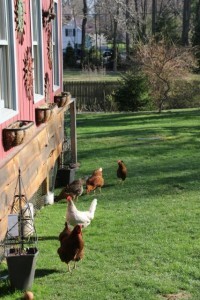 Grace, Kiki, Princess Kate and some chickens out enjoying the new spring grass. Melina on the milking stand. As long as we kept food in the bucket, she was fine. You use special hoof trimmers, similar to garden pruning shears, to trim the hoofs. Gracie was sure she was missing out on something big when Melina was first one in to get her hoofs trimmed. I had to be extra gentle with Kate so she didn't faint on me. 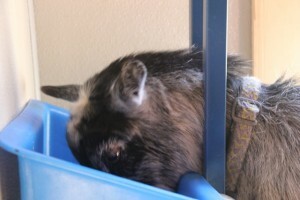 And Kiki, at 10 months old, is still such a peanut she couldn't reach the food bucket/neck lock! India had to straddle her over her legs so I could trim her hoofs. Again, as long as there was food in the bucket, she was happy. Grace hops up on the table outside to offer Evan some computer tips. 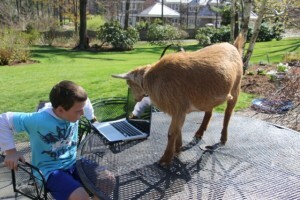 This picture is a perfect example of why most people don't let their goats free range. Look at the difference in this tree from the bottom up to about the middle (where the goats can reach), and how green and healthy the top is. 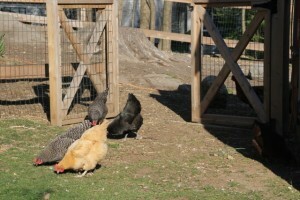 Some ladies enjoy some free range scratching in the shade. 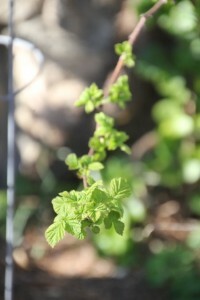 The raspberry bushes are leafing out! 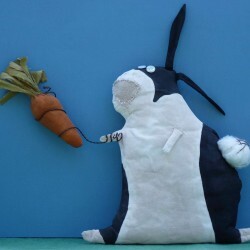 I ordered the most adorable kitchen flour sack dishtowel recently. The Victory Garden of Tomorrow has a very cool series of prints based on historical poster propaganda and the prints are based on their commitment to civic innovation and social progress. 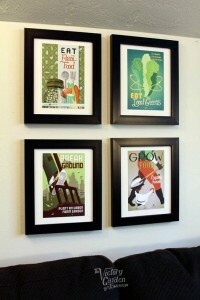 I thought some of them framed would look very nice in a grouping. I ordered off of their website, but when I just came across their Etsy site, it turns out they did too! 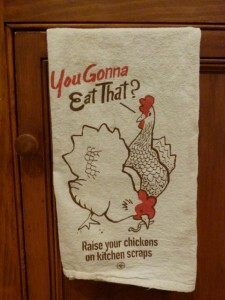 And here’s the dishtowel I just had to have. After only one wash it’s nice and soft and absorbent. 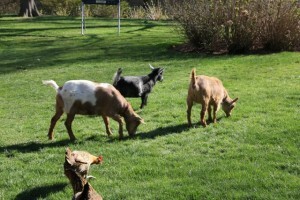 So use this post as your reminder to let your goats and chickens out for a little free-ranging if you can, and don’t forget the spring worming and hoof trimming!